I've recently done a retrofit of AWD from 2010 Golf R to my 2011 Scirocco R. To keep it simple, mechanically it required changing the boot floor, gearbox (DSG) and rear axle (together with Haldex coupling) from Golf to Scirocco. Some work with fuel tank and exhaust pipe also. Wiring was simple, Haldex control unit only requires power, signal from brake pedal and powertrain CAN bus. With VCDS I've activated AWD on engine ECU and CAN gateway. All the fault codes are gone except one on ABS which leads to ESP not working. Not sure if I need to recode something on ABS control unit. Any idea if there is some other control unit on powertrain data bus where I need to enable AWD or is just about the coding on ABS control unit? Luckily I have another 2011 Golf R available for comparison. It has the ESP control unit with same part number (1K0 907 379 BE). Just the coding is different. If been searching and found out that part of the ESP coding is the last 5 digits of VIN. Besides those, there are just a few bits that are different between FWD Scirocco and AWD Golf. I still haven't tried coding the ESP to play with those bits (will do this coming weekend). Golf has DCC, Scirocco not. That might also explain some of the differencies on coding. Originally Posted by Heikki J. Right, it most likely wouldn't, because the dealer's tool doesn't have a coding script for these MK60EC1 modules, instead it queries SVM database which simply returns the coding that the car had when it left the factory, with the factory installed equipment. With some approved retrofits, e.g. a trailer hitch installation, it's possible for the dealership to enter an "SVM Code" that tells the SVM server that there's now a trailer hitch on on this car and the SVM server then calculates a new coding for the car (and remembers that the car is supposed to be coded that way from now on). Unfortunately, this also makes it very hard for anyone to derive a reasonably complete coding chart for these modules. Some people claim to have it figured out; I'm not sure we really do. What should be helpful in your case is that your ABS module still has the coding for your care pre retrofit. Hopefully we'll get the right eyeballs and brain cells on this to find you a solution. I tried to change the coding over the weekend without success. I get an error message "coding out of range". 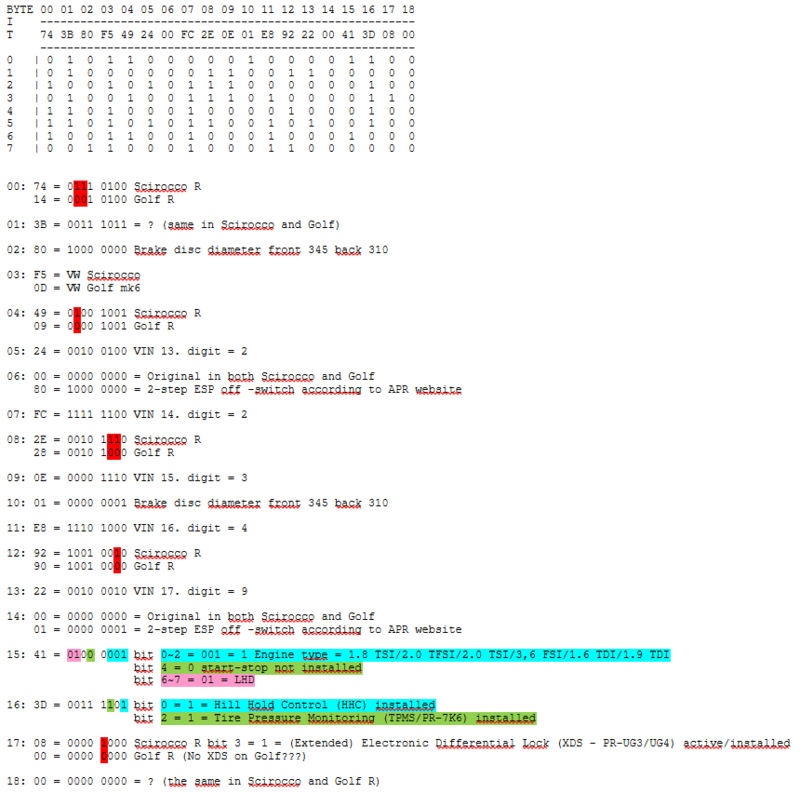 In this case I only tried to alter one of the last bytes to match the Golf coding. Last edited by Heikki J.; 03-17-2014 at 10:38 AM. I do have one extra ABS unit from the 2010 Golf R that I took my parts (transmission and rear axle) from. It was with DCC suspension. But you'd need to recode it anyway. I don't know that we will be able to take the original ABS coding and tweak the AWD specific bits but a large part of the VIN is encrypted into the coding as you mentioned. If you could post the pre-retrofit ABS coding with the full VIN from this car and in another clip, the factory coding from the 2011 Golf R comparison car with factory installed AWD and the VIN from that vehicle I'll take a look at it. Wrapping separate [code]s would be best so I don't confuse them. If you want to include Scirocco (or any other Golf based comparison scan clips and VINs feel free to do so - but I think the baseline from the two would be sufficient for now. 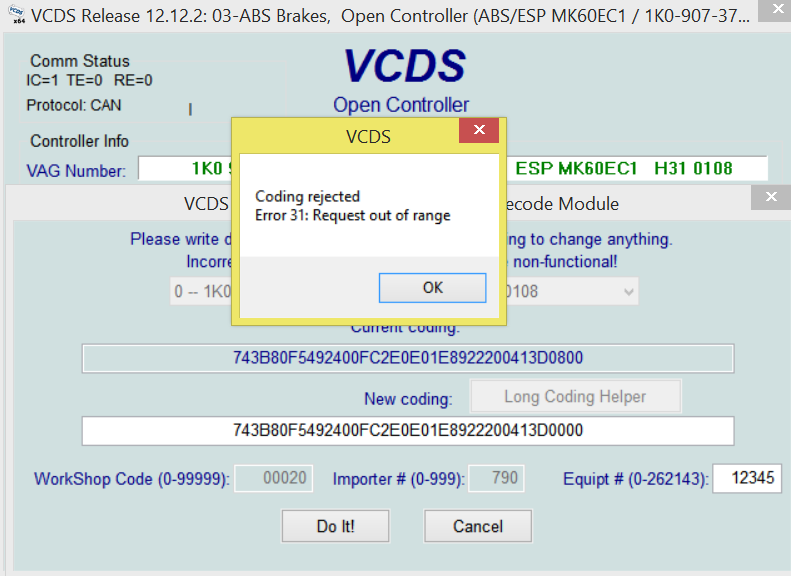 Any idea why I wasn't able to change the coding with VCDS? What does this "request out of range" -error mean? I'm not able to scan the Golf right now as it's being painted 50km from here. Scirocco's scan I already had on the first post. Or would you need the scan of the whole car? Any new information to share to me? Not yet so we'll get this back to the top. I could get full scan of both cars tomorrow if that helps.